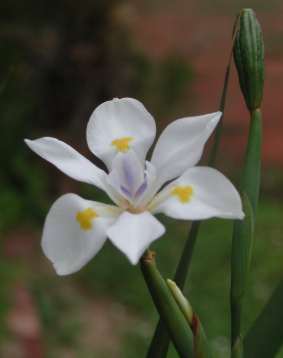 Dietes iridioides is not common in residential gardens and landscapes, yet it is considered a good garden subject. Dietes iridioides is a rhizomatous, evergreen herb, up to 600 mm high, with sword-shaped, dark green leaves in a loose fan. This prolific flowerer carries its flowers on a wiry, arching stem. The flowers are dainty and each bloom lasts a single morning. New flowers open continually during the flowering spell. Its flowers are subtended by white sheathing bracts; the inner petals are often marked with brown streaks near the base; the style branches are lightly flushed with violet, 30-40 mm wide. The flowers are closed by midday except on overcast days. Flowers are produced from spring through to summe. Fruit is a capsule, oval shaped and it disintegrates to release black seeds. This plant is widely distributed, from the Eastern Cape through to KwaZulu-Natal and Gauteng in evergreen forests or clearings in bush. Dietes is derived from the Greek dis, meaning twice, and etes, meaning an associate, thus two relatives, drawing attention to the position of this genus between Moraea and Iris. About five species make up this genus of indigenous, rhizomatous plants. Often seen in gardens are D.grandiflora and D. bicolor. The plant can self-pollinate when the flower closes, bringing the male flower and female flower parts together. Bees and other insects also pollinate the flowers. Infusions made from the inner part of the rhizome are taken orally in enemas to treat dysentery. Rhizomes are used during childbirth and also for hypertension (Pujol 1990). Ground rhizomes are ingredients in tonics for goats (Hulme 1954). Roots are used for first menstruation. Some people call this the rain iris as they believe that flowering of this plant presages rain. Some African cultures believe that, if you have been to a funeral or entered a house with a corpse, you must chew the rhizome and spit on the ground to take the bad luck away. And if you do not chew the rhizome, an immediate member of your family is going to die. These tough, drought-resistant plants will thrive in semi-shade as well as full sun, often where little else will grow. Dietes iridioides will tolerate both wind and frost, and seeds itself freely. 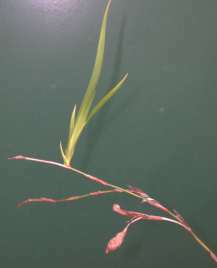 Plantlets often develop on the flower stems and root easily when they touch the ground. 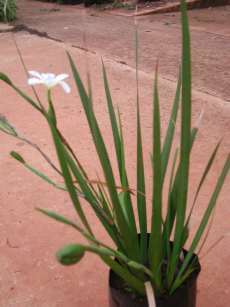 Dietes is effective in mass plantings under trees and around water features. Sow seeds in spring or divide large clumps which spread by means of rhizomes. Manning, J. 2003. Photographic guide to the wild flowers of southern Africa. Briza Publications, Pretoria. Pienaar, K. 1992, 2000. What flower is that? PUBLISHER? CITY ? Pujol, J. 1990. Nature Africa: The herbalist handbook. Jean Pujol Natural Healers Foundation, Durban.